Comprehensive eye care services at Andrew Stone Optometry include treatment for a broad range of vision problems and eye diseases. Some of the conditions we regularly treat include cataracts, glaucoma, macular degeneration, diabetic retinopathy, eye allergies, dry eye and eye infections such as conjunctivitis (pink eye). We listen closely to your observations about vision difficulties, then provide reassuring, technologically advanced diagnosis and treatment available in Columbia. Our optometrist, Dr. Andrew Stone, is a member of the American Optometric Association and Missouri Optometric Association. Dr. Stone is expert at identification and treatment of eye problems to maximize vision, achieve cures and slow any conditions that can't be cured. Translucent at first, cataracts are filmy growths that can become milky looking on the outside of an eye's lens. 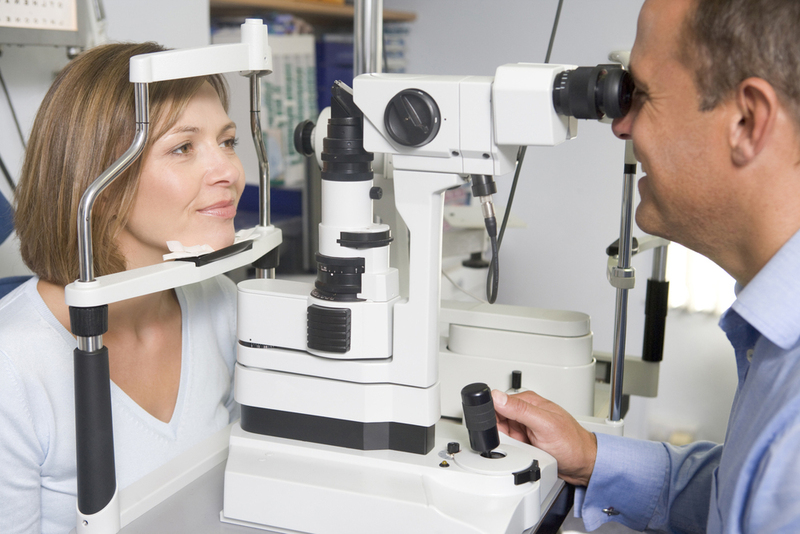 They cloud vision, affect depth perception and eventually must be surgically removed. Glaucoma is the major reason for the onset of blindness in people over age 60. Fluid buildup pressures then damage the optical nerve at the back of the eye. Treatment may be as simple as taking eye drops to lower pressure on the nerve. Although irreversible, glaucoma can be minimized and slowed. If you have a clear peripheral vision yet increasing difficulty with reading, depth perception and seeing clearly when looking straight ahead, you may be developing macular degeneration. This condition is caused by leakage from abnormal blood vessels and formation of excess blood vessels, a problem called angiogenesis. Treatment to slow this deterioration of central vision is may include injections of angiogenic medications, consumption of vitamins and laser therapy. For diabetics, elevated blood sugar for long periods of time may cause blood vessels to hemorrhage in the vitreous gel between the eye's lens and retina. This harms the thin retinal tissue at the back of the eye and may lead to blindness. Treatment for slowing this as yet incurable disease involves good control of blood glucose through healthy diet and, perhaps, laser treatment or surgical removal of the vitreous gel. Eye discomfort from itchiness often is caused by the kind of allergies that also affect breathing and result in bumpy skin hives. Dry eye is a separate condition in which the eye's tearing abilities are impaired. It shares some of the symptoms with allergic reactions -- such as oozing and a gritty sensation but generally is not itchy. Both can be treated with eye drops, but allergic control requires treatment by an allergy doctor. Dr. Stone can help you determine whether you have one or both conditions. Your Columbia optometrist can also help you differentiate the redness and discomfort of allergies and dry eye from the itchy, oozy swelling of eye infections such as conjunctivitis. Antibiotics cure this condition. Contact Our Local Optometrist in Columbia for More Information Today! For more information about these eye conditions and how we treat they please call Andrew Stone Optometry. Contact us at (573) 445-7750 to schedule an appointment today. We are located in Columbia at 2012 Cherry Hill Drive, Suite 201.